I’ve dreaded reading this novel for quite some time. Not because I thought it to be a bad book, but because—to me—it was the end of an era. I started reading the Discworld novels fifteen years ago, during one of my very first internships abroad. 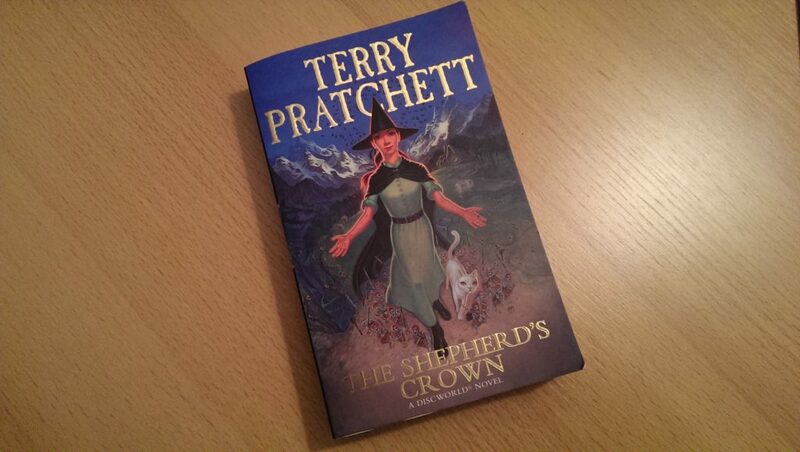 From that point on, no journey in my life ever took place without at least one Discworld novel in my bag. Now, with Terry Pratchett sadly taken from the world of the living and books (and his daughter confirming none will continue the series), I have no choice, but to say goodbye to one of the most marvelous—and extremely funny—series I’ve read in my life. In the final Discworld novel, readers return to the Witches. The ladies in pointed hats have never been a favorite of mine within the total Discworld setting. I rather read about the city watch, or even better the wizards—Rincewind in particular. So, the book already had a strike against it from the start. But, as I started reading, that didn’t matter anymore. This book wasn’t a single book that tried to grab and hold my attention. This book represented an entire era coming to its end, and it greatly influenced how I perceived the book. I don’t want to spoil much of the story itself, but it’s safe to say many familiar names from the Witches story arc fly by on their broomsticks. The storyline is nice and compact The writing high quality. It follows the young witch Tiffany, as she tries to make her own place in the world. We read about her attempts to balance everything and keep everyone happy (and naturally failing at it, like any other normal/real human being). And of course, the feebles were a fun little bunch as well. So far, so good. But I do think Terry wasn’t completely done dotting all the i’s yet when he was greeted by the man that speaks in CAPITALS. The story or dialogue often feels…short. It’s certainly not among the best in Pratchett’s series—a similar feel I had with Raising Steam—which probably has everything to do with the illness he fought to keep at bay at the end of his life. Despite those things the book had a big impact on me. The start of the book had me nearly in tears. The events written feel like they described Terry Pratchett’s own state of being near the end of his life. I have no idea if this was intended by him or not, but, as a reader, I felt he gave me the opportunity to say goodbye to him; a man I’ve never met, but who, in a strange way, was such a large part of my life. He showed me how he got his things in order. It was like a message he left, stating that he had said many things, and would like to say many more—but it was not to be. It took me a day or two, before I continued after those first fifty pages or so. All because I needed to reflect and ponder on this aspect of the book. I have rarely read a book intro that had such a deep impact on me.